Centuries ago, salt cod was a vital item in international commerce, and today the salted and dried fish remains a traditional ingredient in cuisines around the Mediterranean and Atlantic. Known by many names (baccalà (Italian), bacalhau (Portuguese), and bacalao (Spanish), to name a few), this delicious and flavorful fish is so versatile and easy to cook with. One of our favorite preparations are salt cod potato cakes, such as these from mother-daughter catering team from Paulding & Company in San Francisco. 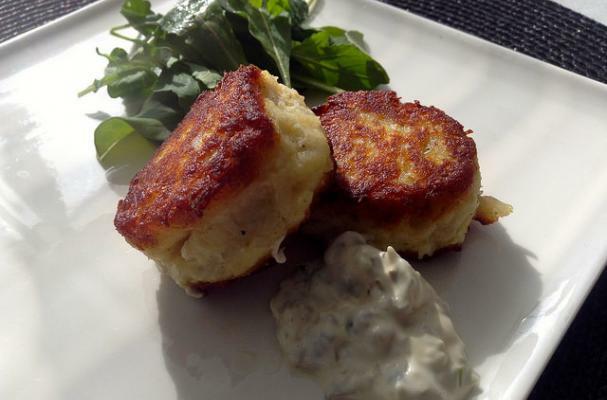 These tender and fluffy fish cakes will have your guests begging for more! We recommend doubling the batch and freezing some, uncooked, for future meals. Be sure to see their tips below on how to make your own salt cod. Peel, halve and boil the potatoes in salted water until tender. Drain and let dry over a very low flame for a minute. Cool slightly. Pick any bones from the desalted cod (*see note below). Cover with water, bring to a boil, and cook until flaky. Drain. Mash the potatoes until lump-free with a simple hand masher. Add the cod, beaten egg and parsley, season with pepper, and continue to mash until you have an almost-smooth mixture. Taste, and if needed, season, and add a little lemon juice to brighten the flavor. Make small cakes, heat a non-stick or well-seasoned cast iron pan over medium heat, and add a layer of oil or butter. Fry the cakes until the bottom is browned, turn with a spatula, and cook the other side. Serve hot, with a little tartar sauce. Combine ingredients. Taste and adjust seasonings. Keeps for up to a month in the refrigerator. *Note: Some fish mongers will desalt the cod before selling. If it is not desalted, soak the fish in a pot of cold water for 24 hours or up to 2 days (depending on thickness) in the refrigerator, changing the water 2 to 3 times a day. All you need is “true” cod, such as Alaskan cod, and kosher salt. Simply bury the cod in a heavy layer of salt and refrigerate for 24 hours (example: for a 5-pound cod use a whole box of salt). Rinse the fish, wrap in cheesecloth, tie with twine, and refrigerate. Store it on a rack in the fridge so it gets air circulation all the way around. A day before you cook the cod, cover it generously with cold water, and refrigerate. Before using it, drain and rinse one more time.